The Future Leaders Series is “Young Australians in International Affairs” new program designed to engage Australia’s future leaders in the critical issues affecting Australia, the Indo Asia-Pacific region and the international system, and equip them with the knowledge, skills and networks to respond to these challenges and shape future policy decisions. The Future Leaders Series comprises a series of modules, each focusing on a particular issue or challenge, which will run for between 4 and 6 weeks. During a weekly workshop or seminar facilitated by an expert in the field, participants will have the opportunity to explore the different aspects and dimensions of the issue, and the challenges and considerations facing Australian policy maker. 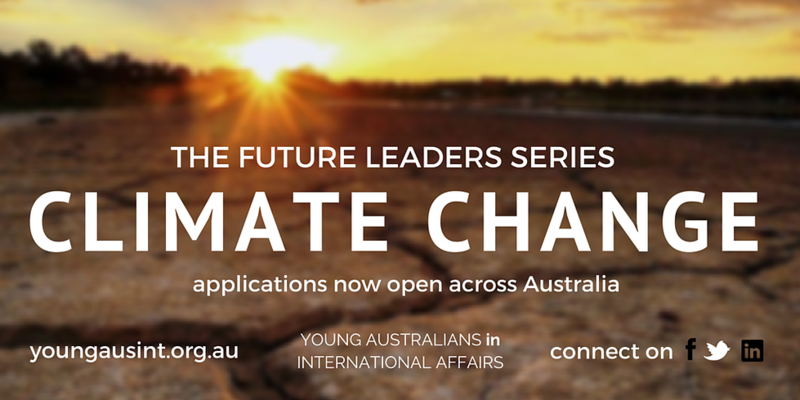 As a participant in the Climate Change Future Leaders Series, you will have the unparalleled opportunity to engage with leading experts and explore the different aspects of climate change, international responses and action on climate change, what climate change will mean for Australia’s national security and its implications for our regional security environment. In the final week, participants will come together to drive a roundtable discussion with their peers and work together to produce a policy brief for publication on our website, which will outline participants key recommendations and suggestions to policy makers in addressing the security threats of climate change. For further information and to apply, visit www.facebook.com/events/1580713182208391/ or www.youngausint.org.au/#!futureleaderseries/cem. Applications extended to Friday 1st May 2015.